Just when lustrious Festive Fridays was kicking off the holiday season, visitors came to Cape Charles to take in the “small town charm” of our quaint little village. Yep, observation of road and parking conditions, including reading the posted signage, is the driver’s responsibility. At all times and in all places. No one would make an excuse for a driver running a stop sign. And, no, I don’t fix parking tickets. The idiotic reverse parking regulation should be revoked. It serves no purpose other than to confuse and irritate both visitors and locals. Angled parking is fine, just let folks park front forward, not reversed. Who was the moron who came up with the system??? Larry, you’ve got a great reputation. Why not maintain it by giving our tourists a break and explaining to us what the town is doing to remedy the situation? Thanks for posting the Vimeo – that was really helpful in understanding the logic behind what seems like a strange-at-first parking rule. Wonder if the town might consider giving people a friendly, written warning and instruction instead of a ticket? You might even provide a benefits list with the rule so folks are encouraged to follow on their next visit. Think this would be more helpful and might encourage folks to return, instead of chasing away recurring tourist revenue. 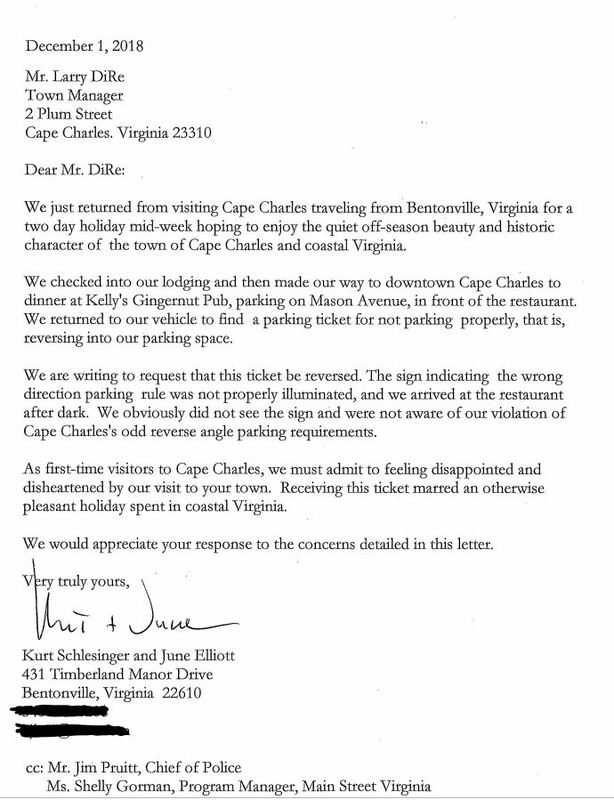 Thanks again for the info and for trying to keep Cape Charles pedestrian-friendly! Great ideas for making life better but I have a couple of questions. Is this guy a registered voter in Cape Charles? Is this guy a Cape Charles/Virginia taxpayer? Did the people of Cape Charles elect you? Note: What does this have to do with reverse-angle parking? C’mon guys, focus on the topic. I have been to 48 of the 52 states and have never before seen reverse angle parking. In my opinion, by todays standards, it’s about as popular as town officials in blackface photos. On one hand we’re RIGHT NOW claiming to be paying professional and particular attention to signage, but then when a very odd traffic sign is obscure and semi hidden, the town accepts zero responsibility for it. “Fixing” a ticket is completely different from righting a wrong. Hiding behind manipulation of verbage in order to dance around the facts is a sad refusal to address the issue. Fixing the weird, abstract parking directive is what makes sense RIGHT NOW in the off season. Cancel the ticket. Quaint and Historic Towns are fun to visit. Not narrow minded ones. If everyone stopped, what could they do? Well, I do appreciate this media and I do like to see all the opinions. I hav received response opinions to mine and they sure do represent a wide range of opinions. Everything from “just do what you want, what can they do?” to “you haven’t seen all these towns/places in your travels with this parking?”, or even, believe it or not, agreement with what I had said. I do like to voice my opinion, so I will follow through with a final response to much of this. First off, I listen to others, so I watched the vimeo. He is apparently getting his point across in Pa, and several location there have adopted this practice. I hear his points. I just don’t think they make more sense than standard pull in angle. A few things. Cape Charles is a town that wants tourist dollars. 2)…Where someone comes from or votes has nothing to do with their right to an opinion. And 3)…Asking Police to do anything but enforce the law is too much to ask. As far as the vimeo, I think accepting his opinion and points is listening to an insurance salesman. A good idea at times, but not here. Children and some adults need guidance, and a door in the way, to keep from walking into the street and traffic ? Okay, sometimes true, and they get that guidance from the driver and responsible adults in the car. For this we reverse the spin of the earth ? Unloading a trunk that is closer to the curb is safer then if out nearer the street ? Well, there’s no argument against that, and it is obviously true, but is this a serious concern in Cape Charles ? Are drivers no longer capable of deciding to unload a trunk when there is no imminent danger ? Are people actually getting run over while unloading their cars ? I’ve read that cars backing out into traffic contributes to more accidents than pulling out. On the face of it, these statements are leading me to believe Mason Ave. is comparable to pit lane at a NASCAR event. Folks are trying to make it sound like it’s almost out of control chaos. If so, I don’t believe the correct issue has been addressed. If more traffic conrol is needed, then do so. But I disagree that reversing parking does that. Look, I personally don’t have a problem with this reverse parking. I have a commercial drivers license and can back a truck or bus through the eye of a needle. It’s just that I know it’s also easier and feels more comfortable for most people to pull in and then back out, rather than the opposite. If anyone else can accept that as a fact and not just a premise, then why should we push people to be uncomfortable ? To me, the question is that simple. Why make anyone/many uncomfortable while parking ? In my opinion, most Americans are creatures of habit. They learn their habits and keep themselves happy and safe at the same time. So they pull in. Okay, I stand corrected. Conshohocken Pa, Brooklyn N.Y. and some other places have reverse in parking. That’s fine. I still say I’ve never seen it. My guess is not that I am blind or not that I don’t pay attention. It’s just that the habit in America is to pull in rather than back in and I’d guess that more than 95% of the angle parking in this country pulls straight in. So that is our habit. Myself, if I were a town leader, I would have been as ready to adopt this idea as I would be to say green means stop and red means go. Deciding to do the opposite of so many other places just breeds discontent and confusion. It’s not worth it. Oh, and let me know how many people are polled on their last ride out of town. Do you really think you hear from most of them ? If I owned a shop on that street, I’d be screaming that losing one visitor made it a bad decision. Why? Because every single business owner knows word of mouth is your best advertisement. Apparently, you missed something in your travels. This is why personal experiences are not necessarily factual. 2. They are all parked back end in. 3. You have to pull into a spot on the other side of the road to park or you have to do this ungodly maneuver to pull in head first on your side of the street. 4. You don’t think something is unusual about your parking job? Sorry, you earned that ticket. Thanks, Mr. DiRe, for maintaining your “great reputation.” Keep up the good work. Mr. DiRe was entirely correct in his response. Unless or until the law is changed, it is every individuals civic duty to observe local ordinances. The “I didn’t know” defense is not a defense. All I know is that when I park downtown, I invariably have a huge truck on my left side. I can’t see over the truck to see what’s coming. I have to pull out quite a way to be able to see anything, and by then if a car is coming along Mason at a good clip, I’m the one who will get hit. With front-in parking, the rear of the car will get hit. If the Pottstown, Pa study showed reverse angle parking to be safer, why would people object to even experimenting with the method? It is because business drops dramatically on streets with reverse angle parking because many people refuse to attempt to back into parking spaces. Business people are sensitive to that. Experience in Austin, Texas showed the problems. [1. video: http://www.youtube.com…] Safety would improve even more if parking were banned! I cannot find a copy of the Pottstown study. Pro only references a news story with the results. I suspect they have made the errors and oversights I will now describe. To start with, there are so few accidents that result from backing out of a parking space it’s a non-problem. For Automobiles, “Road traffic accidents generally fall into one of four common types: Lane departure crashes, which occur when a driver leaves the lane they are in and collide with another vehicle or a roadside object. …accidents at junctions … Accidents involving pedestrians and cyclists [and] Collisions with animals.” [4. http://en.wikipedia.org…] We have accounted for the bicycle-involved accidents, they are the 1.6% cited. Collision from backing out of a parking space do not fit in the other named categories. they are negligible. I believe the main safety advantage of reverse-angle parking comes from scaring away drivers, so there is less parking. In a experiment on a particular street, there is always a place to go nearby that avoids the reversing. If reverse angle parking became common, less-skilled drivers be forced to use them, and accident rates would soar. Second, accidents in which a parked car is dented by the backing car are often not reported. Once the backing driver hears a crunch, he is aimed to take off and escape the scene. Since injuries from backing accidents are virtually non-existent, the main safety concern is with property damage, and more of that is not reflected in the statistics. Third, while reverse angle parking in novel, drivers will take special care in parking. Once the novelty is gone, drivers are likely to revert to their casual ways and the accident rate can be expected to rise. The novelty effect was demonstrated by the introduction of brake lights above the trunks of cars, called a Center High Mount Stop Lamp (CHMSL). Once the extra caution brought about by novelty wears off, less-skilled drivers are forced to use the spaces, and the dents caused by backing are taken into account the alleged safety benefit of reverse angle parking vanishes. It’s almost certainly more hazardous. Visibility for e driver leaving the parking space is improved, but because brake lights and backup lights are in the rear of the vehicle the car is less visible to oncoming traffic. When the car is parked reverse-angle, the brake and back up lights will not be visible, and the driver is away from the traffic by the hood length. Reverse angle parking also encourages drives to dash into gaps in traffic, rather than wait for the traffic light to clear the oncoming traffic from the street. That reduces safety. Head in parking minimizes the risk of denting an adjacent parked car, and it minimizes the risk to pedestrians, who are more likely to be on the sidewalk side of the space than the road side. The pedestrian safety advantage is likely to be greatest in congested areas where pedestrians are tempted to use an empty parking space as a path to the street. There are other reasons why head-in parking is often required. In warm climates, businesses have open doors and backing cars blows exhaust fumes into the shops. Outdoor eating eating areas are subject to exhaust fumes from backing cars. Vegetation is damaged by exhaust fumes and the heat from idling cars. Nearby walls or fences may be stained by the exhaust gases. Keep in mind that in warm climates, a car, especially one with a waiting passenger, may be left idling to keep the air conditioner running. In cold climates, cars may be left idling to keep the heat on. In either case sidewalk pedestrians are blasted with exhaust gas. A reverse angle space on the right side of the street is open to head in parking from the opposite lane of traffic. Drivers cross the lane to grab the space, creating a hazard of driving in the wrong lane. Traffic engineers say “medians or enforcement are key to keeping drivers from the other side of the street flipping into a stall nose in.” Either building a median strip or increasing policing are new expenses not needed with head-in parking. Vehicles usually have much more rear overhang, so experts advise “make sure your sidewalks are wide enough for any expected vehicle overhang (6 foot sidewalks without a planter zone are too narrow).” Wider sidewalks take more land or require narrower roads, neither of which is desirable. Reverse angle parking seems weird at first, and upon close examination it really is weird. It hopes to solve a virtually non-existent safety problem but creates traffic congestion, risks more damage to parked cars, requires median strips and wider sidewalks, and pumps exhaust gas on to shops and pedestrians. But of course, the COMMISAR has spoken, so you peons better just do as the Government tells ya. But boy, you sure can reduce water hook up rates for all of y’alls buddies, cantcha? Anyone wonder why I drove PAST Cape Charles twice this weekend instead of dropping in and dropping a few bucks? Mike, you are to be congratulated on your use of facts……………………….or excoriated…………………..depending on which side of the aisle they prefer. Are there local stats available that would put this issue to rest, one way or another? VDOT or the FHA might have them, but it would be buried in the accident stats. Now the town has that whole couple of hundred bucks in fines, at the cost of how much business to the tax PAYERS in town? Perhaps law enforcement officers across the county, obliged to enforce the laws of their respective jurisdictions, might want to reply to your inquiry as well. And business is not at the taxpayers expense. that would be property values. Happy to help with civic education. And, no, neither the police department nor the municipal administration fix parking tickets. Every. Single. PD. in the country has the option of NOT writing the tickets at the scene, and many actually do NOT write them. As the family member of a NJ State Trooper, I have spoken to many who tell me of their ability to exercise discretion when engaged in a traffic stop. So, in your mind Kelly’s, the Shanty, the many stores and shops are NOT taxpayers? They might be surprised to hear that. How many customers will they NOT have because they read of the intractability of the CC admin? How many more boarded up windows can Mason ave take? Of course they pay taxes. In many varieties. Who said they did not? How much, when, where, and how frequently anyone spends is influenced by numerous factors, including public safety real and\or perceived. A third party receiving a citation for violating the posted parking regulations is, frankly, not a taxpayers’ issue. Whether that’s a property tax, or a sales, or meals tax. Of course officers have discretion. Who said they did not? Does that mean they never issue a citation? Even the state troopers you know? There is a law, until there isn’t. And if the law needs to change, that’s a different matter. 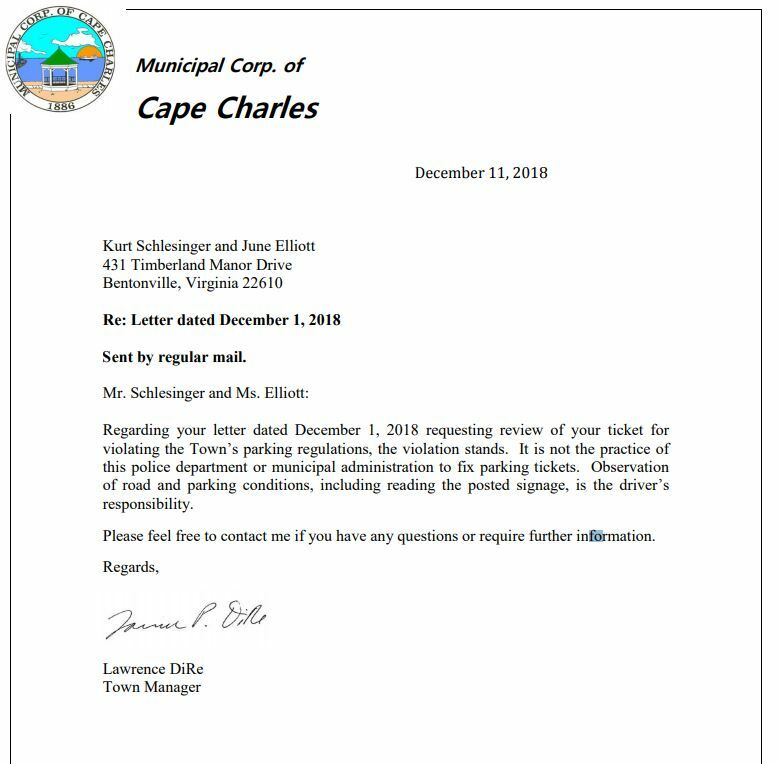 By the way, this correspondence was attached to the Town Manager monthly staff report posted on the Town of Cape Charles website a full month ago. No windows boarded up since. In fact quite the contrary. Have a good day, sir. “And business is not at the taxpayers expense.” But Sir, a lack of business is at the expense of the taxpayers….see, if they have no customers, or less of them then they have less money to pay taxes. A 3rd party receiving a ticket, THEN HAVING IT MAKE NATIONAL EXPOSURE does impact business. Are you aware of the cost to acquire customers? Are you aware of the cost to Kelly’s of losing that repeat customer? And to paraphrase an old commercial, then they’ll tell two friends about it, and so on and so on……..and now!! We have that info spreading over the globe, not just local impact. See, when the seats that promulgate the sales and meals taxes are empty, so is the tax coffer. 1. I see no mention was made of the water connection cost manipulation. 2. Any more $10 buildings y’all wanna sell to insiders? I could use the insurance check too please. BTW, YOU were the one who said the PD had no discretion……..”Obliged to enforce the laws of their respective jurisdiction”. See, this whole thread of comments is ABOUT why the PD did NOT exercise said discretion. Maybe the Town has indicated that they want that revenue, come heck or high water?? IF you cant reverse park you should not have A Licence . Reverse Parking is National Safest The Trunk is at the curb for easy loading and unloading the rear of Car is several inches higher than the front so no damage to air dam on front of Car When Reversing out into blind traffic very Danger. Mr. Russian autobot, it is NOT the safest, and any minor research on the web can point out conflicting studies.